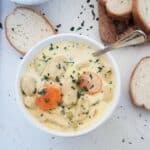 If you need a delicious, comforting, creamy, dumpling soup, Knoephla Soup is right up your alley. This German dish is very popular in some regions of the upper midwest and when you try it, you will know why. cut into 1-inch dumpling pieces and set aside. Add any needed salt to the soup.